Adam Griebie (left) and his father, Joe, were honored last month for their conservation work on the family farm north of Brownton. He’s doing the kind of work he wants to do, living his dream on land his family has farmed for four generations. Adam Griebie can’t do anything but take the best possible care of it. 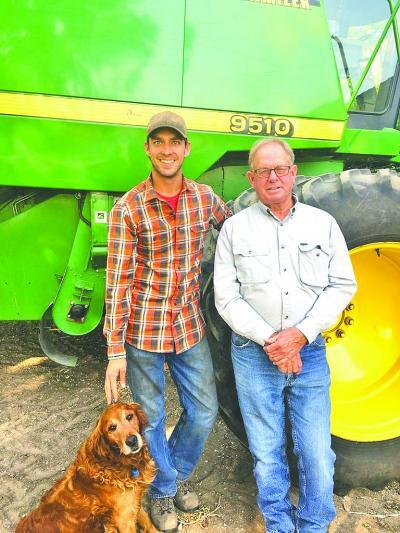 Griebie and his father, Joe, were recently honored with a Minnesota Association of Soil and Water Conservation District Outstanding Conservationist Award at the association’s banquet in Bloomington last month. The pair was nominated by the McLeod County SWCD. The Griebie family farms about 1,000 acres north of Brownton in Sumter Township. Adam and his father cash crop corn and soybeans. The family owns about 700 of the acres and includes wooded acreage and land along Buffalo Creek. Joe’s father, Keith, did some runoff prevention work many years ago to protect sensitive areas. He won the conservation award several years ago but never really mentioned it, Joe Griebie said. “We enjoy having the land. We enjoy keeping the land somewhat wild, preserving it for the next generation,” Adam said.